Now this is some engineering. You’re looking at a model—though sadly, not a working one—of the propulsion systems that will power the Orion European Service Module (ESM). 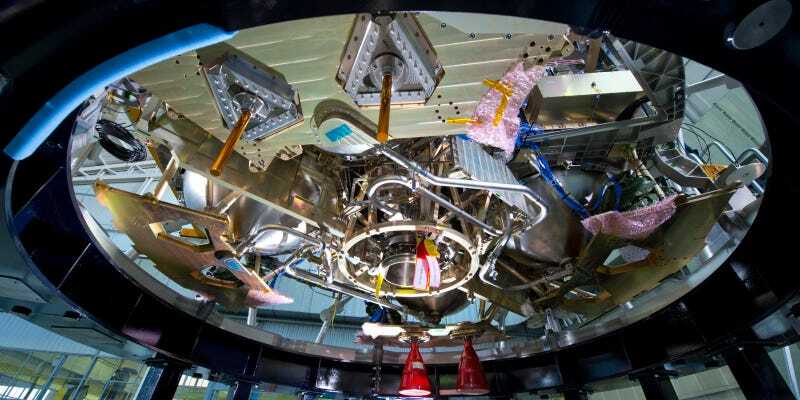 Developed by Airbus Defence and Space, the system is now being delivered to NASA’s Plum Brook Station facility, where will be checked and tested to determine whether it passes strict structural and weight specifications. It’s not the only part of the rig that’s headed there: last week, NASA’s Super Guppy aircraft carried the service module’s stacking assembly interface ring and stack holding stand to the same location. Orion is NASA’s next deep space exploration vehicle, and it will launch atop a new Space Launch System rocket on Exploration Mission-1 in 2018.